2. The Bill for Fryses and Cottons. L. 3. The Bill for Tenures in Capite. - Jud'm. 3. The Bill for the Sacrament of the Body and Blood of Christ. 2. The Bill for Farmers and Lessees. L. 2. For the Assurance of Land to the King by the Earl of Rutland. L. 2. For the Restitution of Blood of the Lord Stafford. L. 2. The Bill for Election of Archbishops and Bishops. 3. 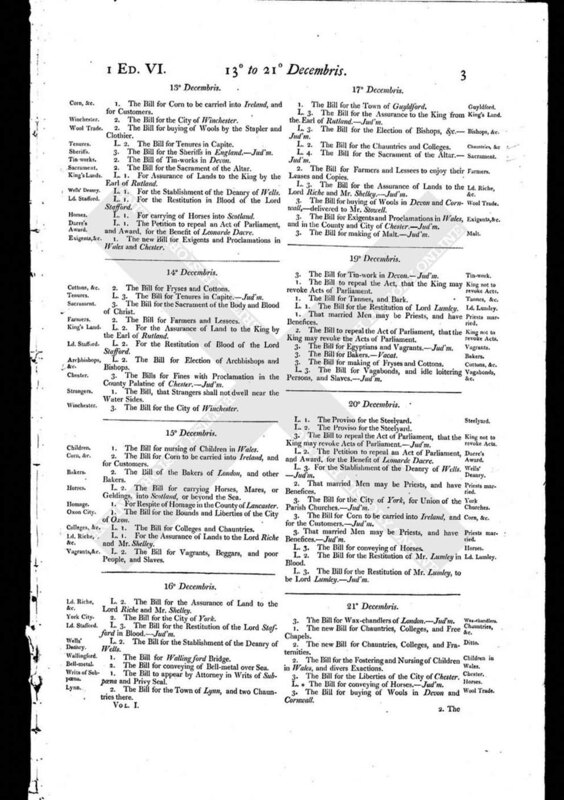 The Bills for Fines with Proclamation in the County Palatine of Chester. - Jud'm. 1. The Bill, that Strangers shall not dwell near the Water Sides. 3. The Bill for the City of Winchester.